London – October 2014. H.R.H. 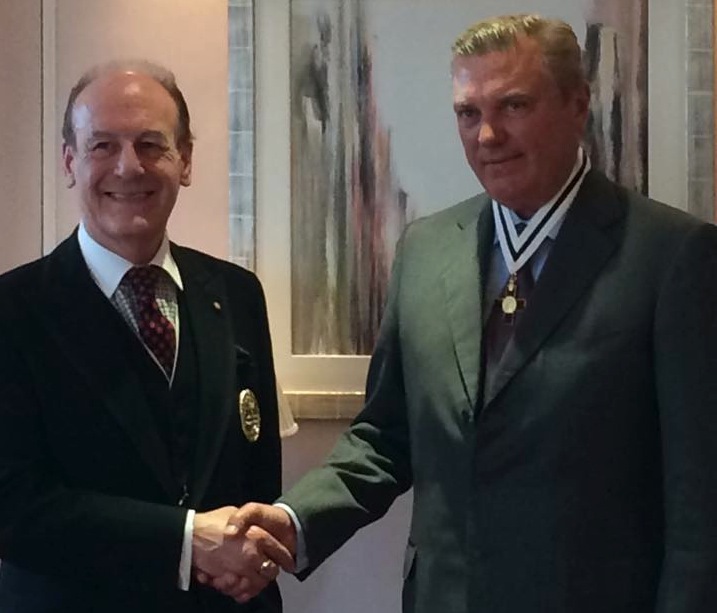 Prince Charles of Bourbon Two Sicilies, Duke of Castro has been awarded the Companion’s Badge of the League of Mercy, in recognition of the Sacred Military Constantinian Order of St George’s voluntary service to wider society in Britain. The awards ceremony took place at the Claridge’s Hotel in London on 8 October 2014 and was presided over by The Rt Hon the Lord Lingfield, President of the League of Mercy. Among those attending were HE Mr Anthony Bailey, Delegate of Great Britain & Ireland, The Rt Hon Lord Lingfield, Mr Nigel Branson JP, Mr Rupert Pearson and Dr Xhoana Papakostandini, Chancery Assistant. H.R.H. the Duke of Castro also made a short speech during the presentation. “My Lord, Your Excellency, Ladies and Gentlemen. In thanking you for your kind words I wanted to express my sincere thanks and appreciation to you, your fellow officers and the League of Mercy for presenting me with the Grand Companion’s Insignia of The Order of Mercy. The League of Mercy was originally created in 1899 for the encouragement and recognition of voluntary work in hospitals and cf auto root apk the wider community. The worldwide Sacred Military Constantinian Order of St George, of which I have the honour to serve as the 59th Grand Master share with you this central mission. I know that our vibrant Delegation here in Great Britain and Ireland is also very much active in these areas too. My Lord, I am needless to say touched that you and your distinguished charity consider my efforts in the service of our faith and of wider society here in the United Kingdom and elsewhere worthy of this recognition. I accept it this Insignia with much pleasure and in the hope that our two organisations with grow in strength as a result. The League of Mercy was founded on 30th of March 1899 by Royal Charter of Queen Victoria. It was instigated by the Prince of Wales (later Edward VII) who became its first Grand President. Subsequently two further Princes of Wales (later George V and Edward VIII) and HRH Prince Henry, Duke of Gloucester succeeded him in this office. The League was refounded as a nationwide registered charity in 1999 and now continues the work of the original royal founder. Among other holders of the Companion’s Badge is Delegation member HRH Princess Michael of Kent.